Modern telescopes have nothing to do with the original Galilean refractor. Galileo’s first telescope had only about 1m focal length and it was built by fitting two lenses in a wood tube. The light-path trough that telescope may easily be explained with a quick and simple diagram drawn on a paper. 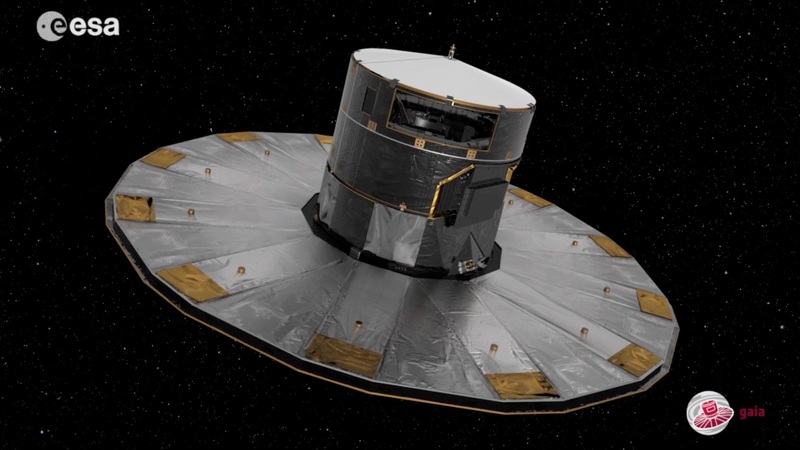 However, Gaia’s scaled payload includes two 0.7-square-meters-aperture, 35-meter-focal-length telescopes built in by fitting 10 micrometrically-designed mirrors in a 3-meters-diameter hexagonal optical bench. The light-path trough such a complex design definitely cannot be properly explained with a quick and simple 2D diagram, hence, scholars face an issue when trying to explain it. 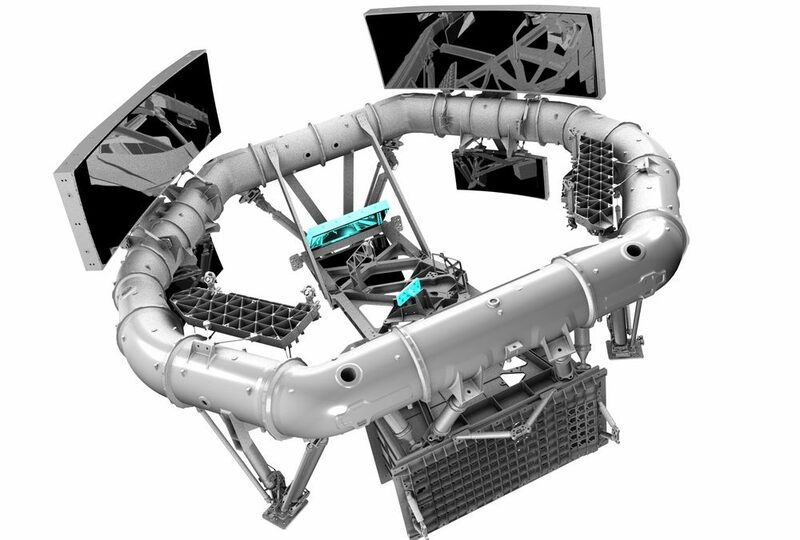 At space robotics, we have given a solution to this problem by building a functional scaled model of Gaia’s payload. We recreated Gaia’s inside at our scaled models’ department and 3D-printed the result. Adjustable supports for the mirrors were then included, and finally, homemade mirrors with the same shape as the originals were attached to them. With distant laser pointers simulating stars, the light paths through these complex telescope are clearly visible when dust or water vapour is scattered into the model. Temperature: (because stars behave as black bodies,) the colour of a star (or the wavelength at its luminosity peak) is related to its temperature, so we can infer its temperature from the observations. Composition: the metallicity of a star and some other chemical abundances can be obtained by examining the lines of its spectra, thus we can get those parameters with a spectrometer. Magnitude a.k.a. apparent brightness / apparent magnitude, this is, how bright the star seems to be from our position in the galaxy. (Bright distant stars might look fainter than faint stars closer to us.) To measure the magnitude of an object a photometer must be used. Luminosity a.k.a absolute brightness / intrinsic brightness / absolute magnitude, this is, how bright the star actually is, the real amount of radiation it emits. To measure the luminosity we need not only a photometer but also the value of our distance to the stars. Parallax, this is the difference in apparent position of an object viewed along two different lines of sight measured by the semi-angle of inclination between those two lines. In other words, considering a distant static background, the stars seem to be in different positions depending on where are we looking from, this difference is measured by an angle called parallax. If we measure this difference we can infer our distance to the star. That is one of the reasons for Gaia to observe each star several times (from different positions). Position: as Gaia knows where its telescopes are pointing to, the position of the stars in the sky is known as soon as they are detected. The position in the sky together with the distance obtained from parallax gives the 3D location of the star. Rotation speed a.k.a. radial velocity. Like planets and moons, stars rotate too, we can measure the rotation speed of a star checking the differential doppler effect between the side of the star that rotates toward us and the side that rotates moving away from us. So again, we need a spectrometer to check the differential doppler effect in the spectra of the star. Proper Motion, this is the change of the star’s position in the sky over time due to a real movement of the star through space. This is another reason for Gaia to observe each star several times, checking its position each time. Radial velocity, this is the speed at which the stars move away or towards us, and can be measured checking the Doppler effect with a spectrometer. Together with the proper motion, they give the 3D movement of the star through space. In other words, Gaia will create a 3D dynamic map with information from over one billion stars that surround us. 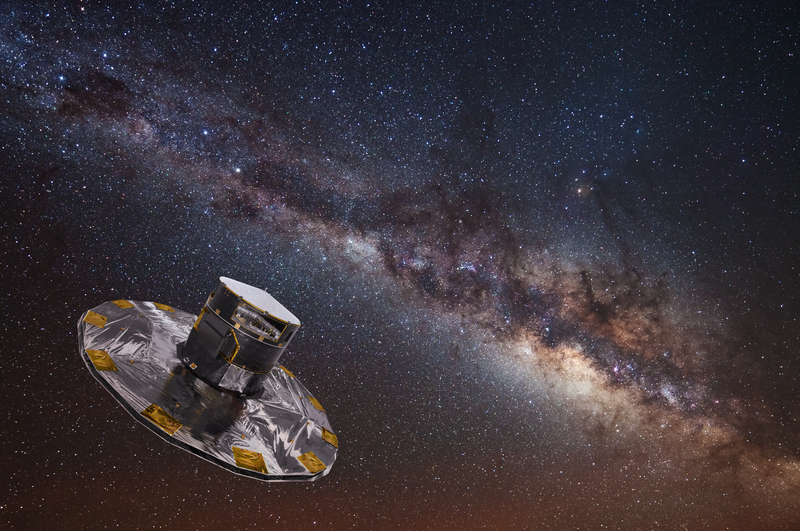 Additionally, Gaia is expected to discover thousands of quasars and exoplanets beyond our Solar System and thousands of asteroids and comets within it. Sunshield: The sunshield is the CD-like structure, its always facing the Sun, the Earth and the Moon to prevent their light to reach the CCDs. Solar panels: Located at the sunshield, facing the Sun, the solar panels provide over 1.5 kW to the spacecraft. Antenna: In the centre of the sunshield an antenna sends data eight hours every day at approximately 5Mbit/s. Thermal tent: The cylindrical structure covering Gaia’s main body. Two telescopes: Two 0.7 square meters telescopes that carry the stars’ light through 10 mirrors to the focal plane. ASTRO (Astrometric Instrument): These CCDs will measure parallax, proper motion, and position. BP/RP (Blue Photometer / Red Photometer): The photometric instrument made of two photometers will obtain a 320-1000 nm spectra. Besides the CCDs it has two prisms to obtain the spectra. RVS (Radial Velocity Spectrometer): It will obtain a narrow band 847-874 nm spectra to measure the radial velocity. Besides the CCDs, it has a diffraction grating and additional optics to obtain the spectra.